Can this 2010 NCAA Lacrosse tournament be any more exciting? The Duke – Virginia semi-final game was unbelievable. (The hearts of these teams were unbelievable.) I’m so pumped for today’s Duke vs Notre Dame. Hopefully it’s another great game. Who will win? After spending an a hour reading articles and interviews from coaches, players, and lacrosse experts, I have come up with the determining factor for today’s game. Go Duke! Go ND! Here’s to a great game! Coach Matt Kerwick is putting together the Men’s Lacrosse Team at the University of Jacksonville. We wish him the best of luck developing the program. He has been successful recruiting some players from here on Long Island (Robert Moore (A) – West Islip High School, West Islip, N.Y, and Kyle Rebman (A) – Baldwin High School, Baldwin, N.Y.) and All-American Peter Deluca (Goalie) – Penn Manor High School, Philadelphia, Pa.
JU starts this year (February 6, 2010) against UNC. Go for it Coach. Here is his recruiting video. If you are looking to play D1 Lax, it’s worth taking a look. You can help build a winner. You play lacrosse in high school. Everyone dreams of playing high D1 college lacrosse at Syracuse, Johns Hopkins, UVA, UNC, Hofstra, Princeton, Maryland, or other top schools. Is it realistic? Sometimes. Usually not. 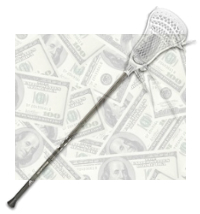 Per the National Collegiate Scouting Association (ncsa.org), there are 287 colleges offering Men’s Lacrosse and 356 colleges offering Women’s Lacrosse. That’s a lot of schools of varying “Divisions”, sizes, and qualities of programs. But it is a lot of schools so there is opportunity to play. You may not end up starting at UVA, but you can continue playing the sport you love after high school. To get money and scholarships you need exposure. Participate in camps and programs. Get out there. Write letters. Get good grades. Network. Speak to your coach. Improve your skills. Many of the Division III schools offer merit, academic, and need-base scholarships. There is a lot of useful information on the web. A good place to start is ncsa.org.